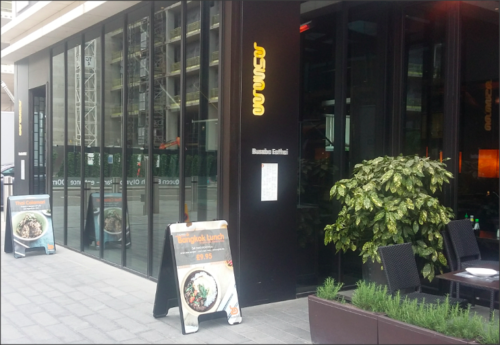 Busaba Eathai (Restaurant) | What's Hot London? The Busaba Eathai restaurants are 12-strong across London giving the capital’s hustled and bustled a much needed pinch of Buddhist philosophy in their dining environments. Central to that philosophy is the concept of Sookjai, roughly translated as ‘happy heart’ or ‘to enjoy’ which will prove attractive to many of the customers who find such a way of life alien to them but probably need to apply it for some much needed life-work balance. There’s a £12.95 set two course menu for those eating to a strict budget but you’d be advised to branch out to the greater delights on offer. If it’s your first Thai restaurant why limit your experience? While waiting for your starter some traditional Mekhong rum is recommended. Distilled from sugar molasses and rice it’s not strictly a rum but neither the whisky it is more commonly known as. The blend of homegrown spices and herbs give it a smooth, powerful taste similar to one or two in the wider rum family yet noticeably indigenous to Thailand. The Mussaman Duck Curry stands out on the menu because of the mouthwatering ingredients of peanut, potato, star anise, cinnamon – and of course duck. Along with an order of chilli prawn fried rice with a touch of lime and cucumber this will prove a memorable introduction to curry and rice Thai-style. At ￡11.95 for the curry and￡9.95 for the rice the total cost is just a tenner over that of the set 2 course menu and much better value. Specialists in stir fries, noodle dishes and curries their selection covers a wide range of tastes and should appeal to both newcomers and old hands. Also you might have noticed that East (Far East) has finally caught up with East (East End) as there are now branches in hip Shoreditch and happening Westfield Stratford. No excuse now not to locate your nearest joint and become the latest member of the Eathai and ‘happy heart’ movement.